Home / Posts tagged "Connor McDavid"
On Tuesday, Connor McDavid set a new NHL record. The 21-year-old captain either scored or assisted on the Oiler’s first nine goals of the season. The previous record was held by former Capitals’ coach and player Adam Oates, who scored or assisted on his team’s first 7 goals of the 1986-87 season with the Detroit Red Wings. Connor McDavid is the best hockey player on the planet, and the Oilers would be nowhere without him. Oilers superstar Connor McDavid exploded for his first career four-goal game against the NHL’s best team, Tuesday night. McDavid scored once in the first period, once in the second period, and twice in the third period to lead the Oilers over the Lightning 6-2 at Rogers Place. McDavid had five points total for the second time in his three-year NHL career. Hey, so this is a real thing. On November 20, Chicago Blackhawks captain Jonathan Toews will be selling toasters, er Toews-ters, to raise money for Jumpstart Charities. The Toews-ter will burn Toews’ face onto every piece of toast you make. Edmonton Oilers forward Connor McDavid and San Jose Sharks wookie Brent Burns are the stars of a new viral ad campaign created by CCM. Split into three segments, the ads have a carnival theme, as the two superstars participate in activities like plate breaking and a water dunk challenge. McDavid, the league’s reigning MVP and Art Ross winner, shows off his deadly shooting accuracy while Burns’ personality steals the show. In his second year pro, Connor McDavid won the Hart Memorial Trophy, the Ted Lindsay Award, and the Art Ross Trophy. Now he’s a candidate for my made-up award, the RMNB Wedding Hero of the Year. 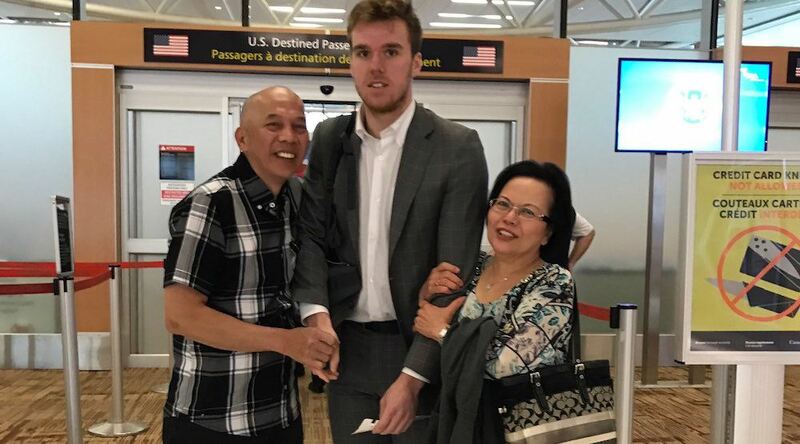 Saturday, McDavid was a guest at Jordan Eberle’s wedding in Calgary. Sure, the gawky McDavid didn’t rip off his shirt like Alex Ovechkin, but he did jump on stage and help a group of hockey players sing a karaoke version of Darius Rucker’s country classic Wagon Wheel.